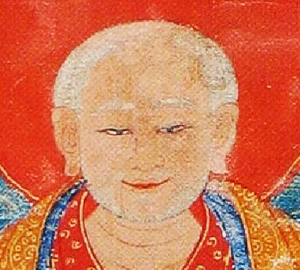 Sachen Kunga Nyingpo was blessed with exceptional intelligence and while very young he studied reading, mathematics, astrology, and elegant discourse. He also thoroughly studied and mastered athletics, medicine, Sanskrit, poetry, composition and other subjects, and became a recognized master of all of these fields. From his father he received the Hevajra initiation and many other Dharma teachings. When Sachen Kunga Nyingpo was eleven years old his father, Khon Khonchog Gyalpo, passed away. Sachen Kunga Nyingpo was still too young to hold the responsibility of leading the monastery, so his mother Machig Shangmo appointed the great translator Bari Lotsawa as abbot of Sakya Monastery until Sachen Kunga Nyingpo became an adult. On the same day, Machig Shangmo also arranged for the laying of the foundation stones for a new shrine and the performance of funeral rites for Khon Khonchog Gyalpo. That year, Bari Lotsawa recommended that Sachen Kunga Nyingpo perform an extended retreat on Manjushri, the Bodhisattva of wisdom. Even though he was only eleven years old, as a future throne holder, he would need to develop great wisdom. At the beginning of the retreat, various obstacles arose that were overcome by the practice of Arya Achala. 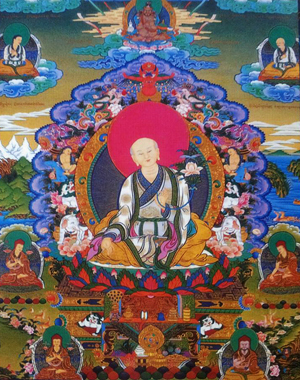 Gradually all hindrances were pacified, and Sachen Kunga Nyingpo developed great meditative realization. After six months of meditation, Sachen Kunga Nyingpo perceived Manjushri himself appear in his retreat cabin. Manjushri bestowed upon him a four-line verse which Sachen Kunga Nyingpo immediately realized was a summary of the entire Mahayana path to enlightenment. This profound teaching became known as Parting from the Four Attachments. At the same time, Manjushri blessed Sachen Kunga Nyingpo with a prophetic vision. Seven wisdom swords emanated from Manjushri’s heart and were absorbed into Sachen Kunga Nyingpo’s heart, symbolizing that seven successive emanations of Manjushri would appear among Sachen Kunga Nyingpo’s descendants, and that his lineage would be forever blessed by this wisdom deity. Through the blessing of this vision, Sachen Kunga Nyingpo developed great wisdom and became able to effortlessly understand all phenomena. Sachen Kunga Nyingpo continued his extensive training. When he was twelve years old, his teachers decided that he should go to study abhidharma with Trangti Darma Nyingpo, who was the most famous teacher of the subject at that time. When Sachen Kunga Nyingpo arrived at Trangti’s monastery, there was no space for him in the monks’ quarters because of the many students already studying there. Sachen Kunga Nyingpo made himself a simple shelter from a curtain in a courtyard in which to stay. Another monk staying nearby contracted smallpox and became very ill with no one to nurse him. Moved by great compassion, Sachen Kunga Nyingpo nursed him until he recovered, as a result of which he contracted smallpox himself. Sachen Kunga Nyingpo became severely ill. His mother visited to comfort and encourage him, and gradually he recovered. Finally Sachen Kunga Nyingpo received the Abhidharma Kosha teaching from Trangti Darma Nyingpo. After hearing it only once, he completely memorized the words and fully understood the meaning. Everyone was amazed at his ability. After that, Sachen Kunga Nyingpo began the study of logic. At that point, the leaders of Sakya Monastery encouraged Sachen Kunga Nyingpo to temporarily set aside the study of logic and to return to Sakya Monastery to receive teachings and transmissions from the great translator Bari Lotsawa, who had become very advanced in years. 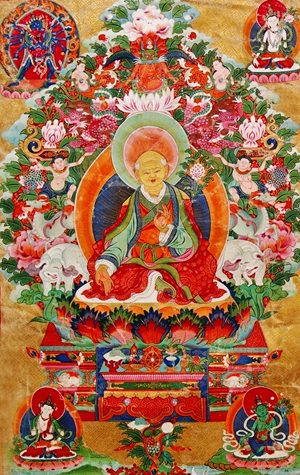 Bari Lotsawa gave Sachen Kunga Nyingpo many teachings on the sutras, including Treatise on the Paramitas; Noble Jeweled Wall; and Sutra of Many Buddhas. Bari Lotsawa also gave him many teachings from the tantras, including about two hundred segments of kriya tantra; Yamantaka and Mahakroda Vinjaya from the charya tantra; five texts on the root and explanation of Guhyasamaja Tantras from the yoga tantra; tantric commentaries written by Nagarjuna; and many other teachings. Bari Lotsawa presented Sachen Kunga Nyingpo with a stone statue of Mahakala known as the Wish-fulfilling Jewel. This holy statue is one of the four streams by which the Mahakala teachings converged in the Sakya tradition. Then Bari Lotsawa transferred the throne of Sakya Monastery to Sachen Kunga Nyingpo and not long afterward passed away. Sachen Kunga Nyingpo continued to receive many teachings and empowerments from other renowned teachers. Although he had previously received teachings on the three Hevajra tantras from his father, he also received an extensive version of these teachings from Khon Jechuwa Dralhabar, as well as additional commentaries, supplementary teachings, detailed pith instructions, and others. Each of these teachings he swiftly mastered. Sachen Kunga Nyingpo was the most intelligent among Khon Jechuwa Dralhabar’s eighty disciples and understood the meaning of all of the texts. Khon Jechuwa Dralhabar passed away, and in his will, he appointed Sachen Kunga Nyingpo to lead his disciples and monastery, and Sachen Kunga Nyingpo accepted the position. He considered taking monastic ordination, but one of his other teachers recommended that if he remained a lay person, it would be of far greater benefit to Lord Buddha’s doctrine and sentient beings. Sachen Kunga Nyingpo visited the great translator Mal Lotsawa and received many teachings from him on a wide variety of tantras including the Chakrasamvara root and explanation tantras. Some years later Mal Lotsawa invited Sachen Kunga Nyingpo to visit again and gave him extensive additional initiations and teachings, including the Mahakala practice. Mal Lotsawa gave Sachen Kunga Nyingpo a black flag which was a holy object of Mahakala, a steel vajra with nine prongs, and the Mahakala mask known as Senba Ngapo Phurshi. This mask is particularly sacred and is the most excellent among the four converging streams of Mahakala in the shrine in Sakya. Desiring to receive the precious Lam Dre teaching, Sachen Kunga Nyingpo searched for the great Lama Shangton Chobar and finally found him at Sagthang. For the next eight years, he received the Lam Dre teaching in a very detailed manner and meditated upon it carefully. Finally, when the oral instructions were completed, Lama Shangton Chobar gave these instructions to Sachen Kunga Nyingpo: “For the next eighteen years, do not allow even the name of this teaching to pass your lips. Needless to say, you should not teach or transmit it to others, nor set it down in writing. After eighteen years, you will become the owner of this teaching, and at that time, if you wish to write it down or teach it to others the decision is entirely yours.” Saying thus, he completely concealed the teachings. So as to be sure not to forget the precious Lam Dre teaching, Sachen Kunga Nyingpo made the commitment to contemplate it in its entirety once a month and to recite the Vajra Verses six or seven times each day. He strictly observed Lama Shangton Chobar’s instructions not to mention or write down the teaching. Soon after eighteen years had passed, Lama Aseng learned that Sachen Kunga Nyingpo possessed the Lam Dre teaching and came to him to request instruction. Sachen Kunga Nyingpo thought that this was an auspicious omen and so he taught the Lam Dre teaching to Lama Aseng alone. He also wrote the Lam Dre Donduma, or Condensation of the Lam Dre Teaching. 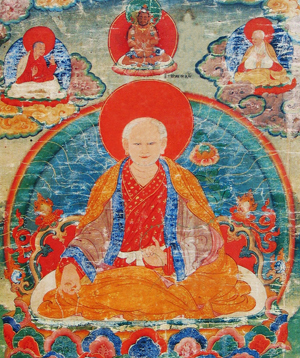 After that, according to various disciples’ requests, Sachen Kunga Nyingpo gave the Lam Dre teaching many times and composed eleven commentaries on it. Among them, the Lam Dre commentary that was written for Geshe Nyak was the most well-written with the fullest explication of the meaning and the most concise exposition. This text is the primary one used today. 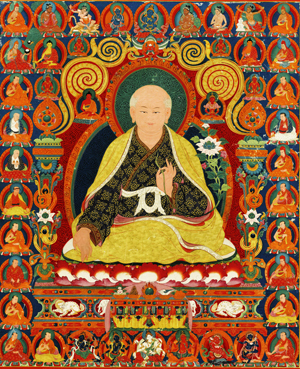 Among Sachen Kunga Nying-po’s disciples, there were eleven heart disciples who upheld the lineage of the Lam Dre oral instructions and seven heart disciples who wrote commentaries on his writings. There were four well-known great masters who were accomplished in both learning and realization. Sachen Kunga Nyingpo held the throne of the Sakya Order for forty-eight years, from the age of twenty to sixty-seven (1111 - 1158 C.E.). He brought the precious Lam Dre teachings and Mahakala practice into the Sakya Order, and firmly established the Sakya tradition of great learning and meditation. He also bore sons who were emanations of Manjushri, among whom were Sonam Tsemo and Jetsun Dragpa Gyaltsen, who are considered the second and third founders of the Sakya Order.